Vermont Creamery was started by two young visionaries devoted to new and non-traditional agriculture, Allison Hooper and Bob Reese. As a college student, Allison spent a summer traveling in France. She worked on a small family farm in Brittany, earning room and board while learning how to make all of the essentials of what was to become her life passion: cheesemaking. Bob always thought he would one day take over his grandparents’ dairy farm. Unfortunately by the time he finished his degree in Agriculture, they’d sold the farm. Appropriately enough, the improbable run as long term business partners began in 1984 during a dinner celebrating Vermont agricultural products. Bob was in charge of the dinner and desperately needed a locally made goat cheese for the French chef’s signature lamb dish. He reached out to Allison who was then working at a dairy lab and milking goats in Brookfield. Allison made the chevre on the farm, Bob delivered it to the chef — the dinner was a success and Vermont Butter and Cheese Creamery was born. They sold first at farmers' markets, then to food coops and French chefs. Back then, fresh chevre, so popular today, was a dazzling exotic foreign delicacy for American palates. Today, more than 25 years later, Vermont Creamery won more than 100 national and international awards. The butters and cheeses populate some of the most prestigious cheese boards in America. Vermont Creamery have sustained a team of family farms and creamery artisans and they thrive making simply great cheese for discerning, appreciative eaters, home cooks and discriminating chefs alike. Quark is a cow's milk cheese, produced all over Central Europe, and is similar to cream cheese or Fromage Blanc. Quark is basically fresh curd. Vermont Creamery is the producer of the product, they make it from fresh local rBST free milk that is coagulated overnight into fresh curd, then drained in cheesecloth and whipped with a trace of creme fraiche. Quark is similar to sour cream or yogurt; snowy white in color with a subtle taste, slightly tangy and a smooth soft texture. 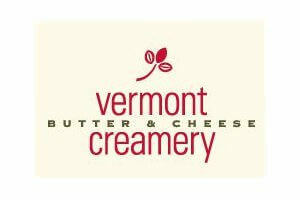 Vermont Creamery's Quark won a number of awards, the latest being a 1st place at the 2012 American Cheese Society Competition. Quark can be used the same way you would use yogurt, so with cereals, muesli or granola eaten as breakfast. Alternatively, blended it with fruit or jam or syrup and serve as dessert or add to sweet sauces or us it in cheesecakes, and mousses.